In any case, after a few minutes of playing around with a few ideas I had to fix the issue this solution was very simple and does NOT involve editing any of the core PHP files. If done correctly, your live site should now be sorting your modified category properly! My example is shown below with pictures, the ultimate goal being to have “2013 Spring” appear as the default selection in the third Listings option (by default, it is sorted Ascending Alphabetical so “2013 Spring” appears first). We need to make a change so that the variable appears first (do not worry about what the final name will be right now). In this case I chose to rename 2013 Spring to 2010 Spring so that this category appears first in the list. I am not sure if the slug needs to be changed as well, I more did it to help myself keep track of the changes and as a best practice with uniformity among categories. After renaming the category in the order we want it to appear, it is then necessary to de-select the category from the back end in Appearance > Theme Options under the Browse Listings tab. In this case, I de-selected the 2013 Spring (renamed to 2010 Spring), 2012 Fall, and 2012 Spring categories, selected a random category, and clicked Save which made the change live in the database and the front end of the website temporarily. After this change and clicking Save, we go back and change the categories back to what we would like them to be. In my case, I needed to select 2010 Spring (which will be renamed to 2013 Spring in the end), 2012 Fall and 2012 Spring. Finally, we can go back to the initial category we wanted to modify and change it to what we would like the final value to be (in this case, changing 2010 Spring to 2013 Spring). Identical to the second image above, we change our settings back to what we would like them to be on the live site. Elegant Themes are affordable and extremely customizable, which makes them a great choice for WordPress developers both novice and more experienced. The only issue is the documentation for these themes is not the best, but with a creative mind and a general knowledge of WordPress one can normally work out a solution to most problems with relative ease. If you would like to focus on what you do best and hire us to customize your theme, get in touch for a free quote and we will get back to you as soon as we can. The update many webmasters have been waiting for (and even more have dreaded) has now arrived. According to Google, an estimated 2.3% of English queries have been affected to a noticeable degree to the average user. For comparison, the original Penguin update affected 3.1% of English queries. None of our clients have been affected negatively, with over 70% seeing improved rankings through the update and the remaining clients maintaining stable rankings. 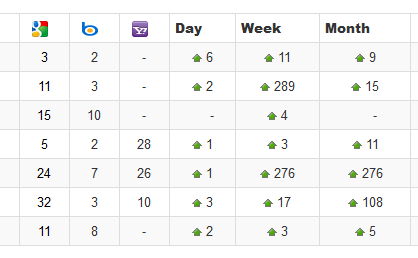 Here are the SERP rankings from one of our clients today (May 23, 2013). We have been working with them since March 2013 on an e-commerce term to boost product sales and gain more company exposure overall. As Google has claimed in the past and more assuredly will in the future: it is quality, unique, and relevant content that is going to win out in the long run. In the near future, I personally believe we will see co-citation becoming increasingly important as exact-match anchor text is phased out, and many more on-page factors coming into play as the search engines evolve. Whether you were hit by the latest Penguin update or are just looking to revamp your SEO efforts, contact me personally today using the form to the right and I will get back to you with some ideas on how we can work together to drive more targeted traffic to your website.